Has mildew infiltrated your wardrobe? Before you toss out your favorite shirt, find out how to remove mildew from your clothes and save your hard earned cash for another day. During the winter, many of us store our spring and summer wardrobe in the basement to keep our closets from overflowing, but these dark and moist places often harbor an unwelcome guest that can destroy your shorts and tank tops – mildew. Mildew is a fungus that typically grows in areas of the home with excess moisture, like bathrooms and basements, and is usually thin, powdery, and white or gray in color. If it is allowed to grow for long period of time, it could turn into what most people would call mold. Lemon and salt – use lemon juice and salt to make a paste, then rub the paste on the mildewed area, and let the garment dry in the sun. You may have to repeat these steps a few times to remove tough stains. White vinegar – add a cup of white vinegar to a bucket of water and let the soiled garment soak for about one hour, then wash the garment in a washing machine with detergent. Like the lemon and salt solution, you make have to repeat these steps to remove all the mildew. Borax – you can either buy borax laundry detergent or add borax yourself to a laundry load. To add it yourself, dissolve half a cup in hot water and pour the mixture into the load once the washing machine has filled up. Then let the washing machine do its thing. Borax works with most colors, but, to be safe, test a hidden area of the fabric first. 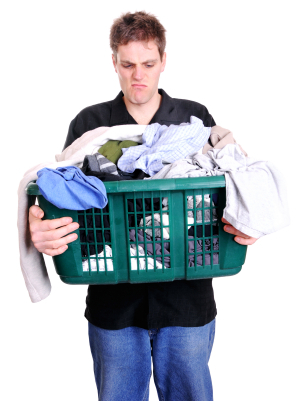 Bleach – washing mildewed clothes with bleach is extremely effective but is not appropriate for all types of fabric. Read our post How to Use Bleach in the Laundry for detailed instructions. If you need any more tips for removing mildew from clothing, stop by one of our laundromat locations in New Jersey for help. An attendant is always on duty and ready to lend a hand.